Autocars Castaño Fuentes, S.L. is primarily a family business with over 40 years experience in the field of passenger transport by road. We are a small company offering excellent services to all customers, always on the line to offer quality and good service always trying to make this a reasonable prices. 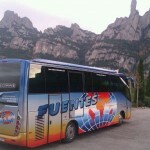 Tours, Domestic and International Travel, Pools, … etc. Our coaches, of which have a large coach section 15, 19, 25, 32, 55, 60 and 64 places to be able to offer our customers the best options. Quality: Because our coaches receiving daily maintenance for later functioning road (Own team of mechanics and technicians). Punctuality: Because reliability and punctuality is Autocars Castaño Fuentes, SL it is already more than 40 years. Legality: Because we are not irresponsible and all our coaches have compulsory insurance of passengers and all the provisions of the Law of land passenger transport. 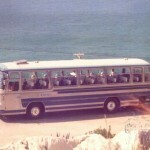 We have coaches for disabled, up to 11 anchors.